Our mobile recording studio enables us to bring our service to you. We specialize in drawing out the original song that lives in everyone. Utilizing workshops, songwriting sessions and recording time we help bring to life a song that is personalized and unique just like your clients. 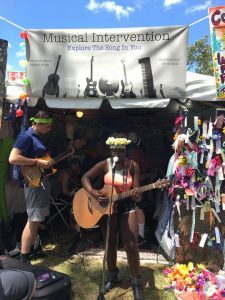 Musical Intervention has been traveling to after-school programs, inpatient clinical facilities, outpatient services and community based programs for over 15 years to help people create original music. We customize groups to fit your needs. Groups can range from 1 to 3 hours and can usually accommodate up to 15 people. 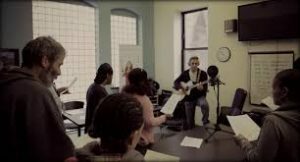 Our facilitator will work with individuals to develop their own original songs. Our facilitators assist in songwriting, arrangement, and production. This group (up to 10 people) aims to write and record songs within a few hours. Mostly the song’s foundation is created in the first hour. The second hour is used to record vocals and finish the idea. It’s surprising how fast a song can be recorded when you focus and create without doubting the process. This is great for beginners as well as more advanced musicians. 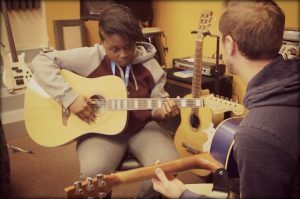 The first hour is dedicated to workshops for multiple instruments by our amazing musical volunteers for the goal of learning a chord progression. The second hour is dedicated to putting melody and lyrics to the progression. The final product will always be a compilation CD of the songs created with Musical Intervention. Optional is a showcase performance for the songs created! Musical Intervention has a headquarters located at 23 Temple Street that is equipped with a performing Sound Stage (recording enabled) and a recording studio. We are able to provide private or public facilitation inside Musical Intervention Headquarters for workshops, jam sessions, and showcases. We also encourage interested talent to become involved at Musical Intervention Headquarters. We offer private sessions Mondays and during the week after regular business hours.